My chest workout will knock you for a loop. Don't expect to spend all day under a barbell. This dumbbell-heavy workout will add size, shape, and striation to your pecs! We all have our unique feature, the one that everybody notices first. The 6-foot-7 dude is perpetually asked, "So how tall are you?" The guy who looks half-man, half-bear is asked, "So how much can you bench, dude?" With me, it's my pectorals. "How in the world did you get your chest muscles to grow like that?" is a common refrain when I hit the gym. I wish I had a dollar for every time I've been asked to reveal my chest workout. Well, here it is. And it won't even cost you a cent. This regimen is responsible for the dense layers of muscle packed onto my pecs. Don't expect any hand-holding. This workout will challenge you to go big, or go home. The core principle of my training programs is heavy compound movements. When I say heavy, I mean 85 percent of my one rep max. This means my rep range usually falls somewhere between 5 and 8. The purpose of these heavy reps is to induce myofibrilla hypertrophy, which is a process where actin and myosin contractile protein increase. Sarcoplasmic hypertrophy, on the other hand, occurs where fluids in the muscle cell increase, causing the muscle cell to expand. Although I occasionally perform higher volume workouts, the majority of my chest training is made up of heavy lifts. I don't spend much time under a barbell, though. My workouts include dumbbells, cables and my own body used as weight. I also hit it from many different angles. Pro Tip: I start every chest workout with incline dumbbell press because the upper chest is usually the hardest to develop. I want to attack it when I have the most energy to ensure maximum intensity—this equates to maximum growth. Pro Tip: I like to follow incline press with flyes because they target different muscles and really stretch the muscle fibers. This elongation helps to achieve the striations you see on my chest. 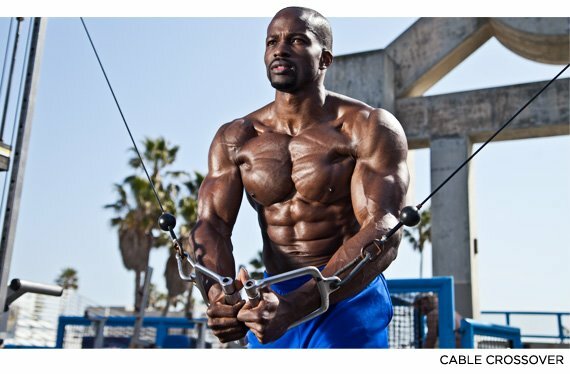 These lines can be the difference between a good chest and a phenomenal chest. Pro Tip: Be extremely careful when you do this lift. Always have a spotter, use moderate weight, and stay in control. It's called the Guillotine press for a reason! Pro Tip: Contrary to common knowledge, dips actually target the chest muscles, not just the triceps. 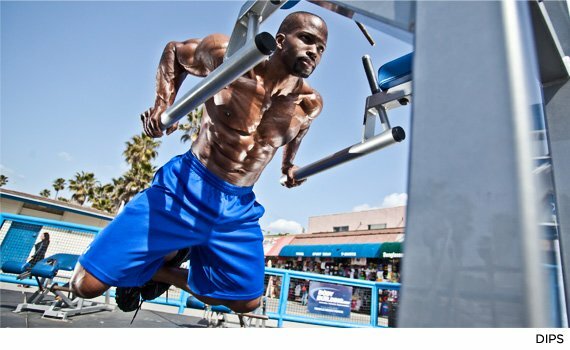 If you work your chest and triceps on the same day, dips are a perfect exercise. Angle 1: Stand straight up and put one foot in front of the other. The end of the flye movement should end with both hands together at eye level. The emphasis is on the upper chest. Angle 2: Lean forward and face down toward the ground. Finish the flye movement with both your hands together in line with the middle of your chest. The emphasis here is the mid-chest. Angle 3: Stand parallel to the cables and end the flye with both hands meeting together at the bottom of the quads. This movement emphasizes the lower and outer chest. Pro Tip: You probably won't be able to finish the entire superset with the same weight, so don't feel bad if you have to use less weight. You may also feel stronger or weaker depending on the angle, so adjust the weight to make your work harder or easier. Remember though, this is a superset, so make sure you make the transitions quickly.